These entrance systems are technically not all glass, but are better described as fully tempered heavy glass incorporating metal rails, small metal fittings and structural silicone. The entrance doors are the focal point of any building or space, and a fully tempered heavy glass entrance combines beauty, strength and safety. Style 3: Partial rail for top & bottom pivot corners. This also accommodates the smaller profile patch fittings. Lock is not available in this style. Style 4: Partial rail for top, bottom and at the leading edge of the door. This style can accommodate smaller profile patch fittings. Fully tempered heavy glass doors can be utilized in sliding door systems by use of either bottom rollers or top-hung hardware. Floor mounted systems use roller devices mounted into the bottom door rail and roll on a floor track. 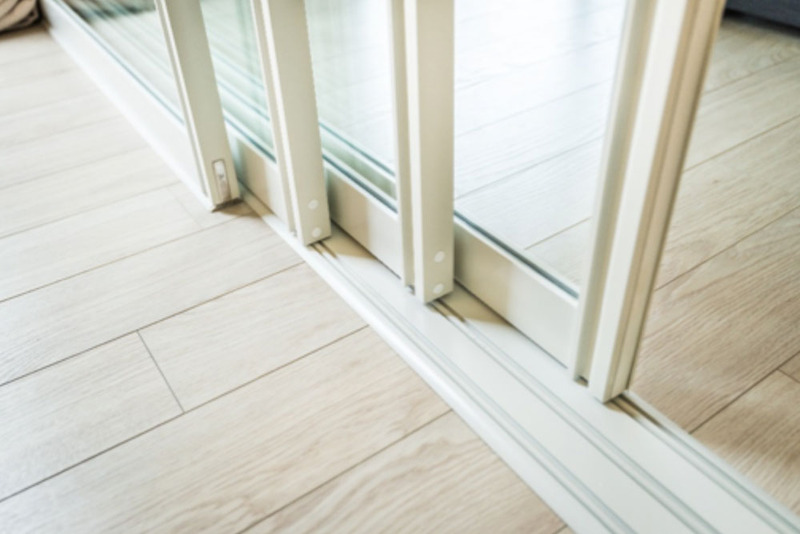 This type of sliding door operates on multiple, parallel tracks, which must be kept clean to allow smooth operation and prevent damage to the rollers. A u-channel is commonly used as a top guide to support the system. Top-hung sliding door systems can be more versatile. They can be operated in a single plane and stacked in a remote parking area either parallel or perpendicular to the opening. Top-hung systems are usually smoother operating and easier to maintain because the operating hardware is located away from traffic areas. A major consideration when installing a top-hung track system is that it must be installed level and securely anchored to an adequate overhead structure capable of handling the weight of the door panels. Special structural support may be required in the stacking areas due to the concentration of the weight of the door panels. Most fully tempered glass doors are secured using a dead bolt lock with standard keyed cylinders and/or thumbturns. Both types can be mounted into a door rail or patch fitting. They are typically mounted on the bottom of the door with the bolts securing into a strike plate or threshold. If a round throw bolt is used, a covered, “dust proof” strike can be used to prevent dirt accumulation in the strike area. Occasionally, it is desirable to have the lock located on the edge of the door to strike into the jamb of the opening. A center lock housing is mounted on the door handle height to accommodate the lock. The strike plate can be mounted in a strike housing installed on the adjacent sidelite or into a strike mounted in the door jamb. Electric locks and strikes, both drop bolt and magnetic, can be installed on all glass doors. 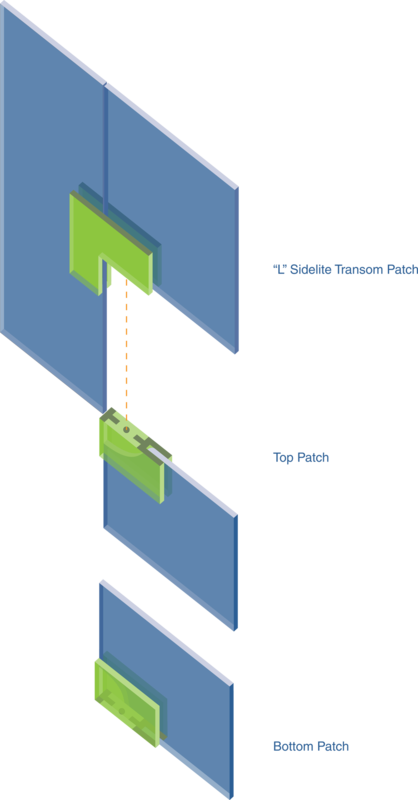 Exit devices can be installed in fully tempered heavy glass doors engaging in top, bottom and/or jamb of the opening. A variety of shapes and styles of handles may be used on fully tempered heavy glass doors. The most common are one-inch diameter metal pull handles attached through holes in the glass. Pulls can be vertical or horizontal, straight or offset. Handles are available to match the metal finish on the door. Sidelites and other fixed glass may have rails, at top & bottom or bottom only, to match the rails or doors. To maintain an even sightline with door, track/saddles of various heights are provided. The track/saddles must be anchored to a load carrying building structure at ceiling and floor. Additional anchoring of the rail to the track may be required. 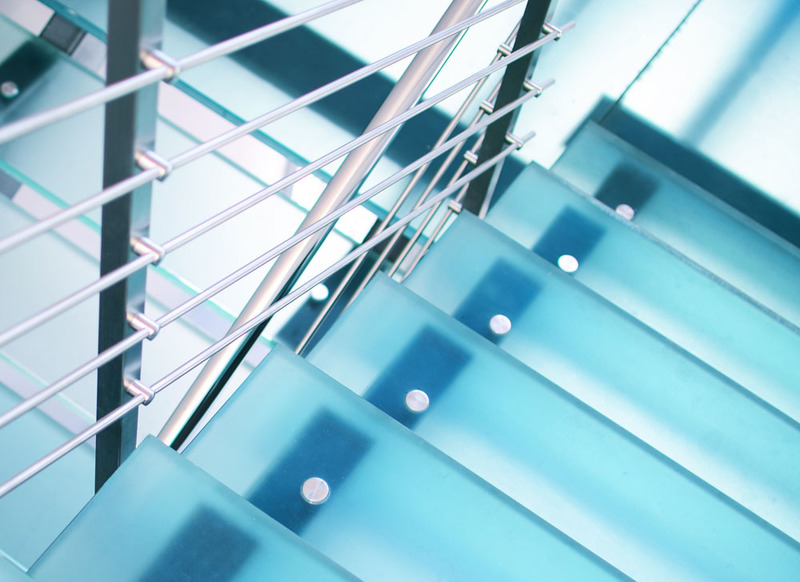 It is strongly recommended you use laminated glass in a railing application, based on the potential breakage. Building codes define the uniform and concentrated loads for walking surfaces. Load requirements are generally defined by occupancy and use. The glass selection must minimize the risk of total glass failure. For safety reasons, laminated glass should be used. Single glass, including fully tempered glass is not considered a safe product for this application regardless of its thickness or design factor. Walking surfaces may experience breakage from impact, severe surface damage and concentrated loads. In high traffic areas, abrasion and other marring of the top surface often results in an unsightly appearance after a period of time. In some installations, and expendable cover plate is added to the laminated glass. This is generally a relatively thin, fully tempered glass. It is laid on the laminated glass with an intervening plastic sheet. This glass is removed and replaced as it becomes marred. The walking surface is often treated to minimize the risk of a person slipping on that surface.